On behalf of monopoly firms and local elites in their countries, imperialist states have been competing to rewrite international and national legal systems and regulations through trade and investment agreements such as the Transpacific Partnership Agreement (TPPA), Transatlantic Trade and Investment Partnership (TTIP), Economic Partnership Agreements and the Comprehensive Economic and Trade Agreement (CETA). They include institutionalizing mechanisms for Investor-State Dispute Settlement that grants de facto veto power to multinational corporations over regulations or reforms that governments might adopt under increasing popular pressures for immediate relief and reforms amidst the crisis. Trump has threatened to pull the US out of the TPPA and TTIP in the face of rising popular resistance to these imperialist trade deals. But this is fundamentally a smokescreen. In future many such deals could be forged bilaterally as opposed to multilaterally. Trump will push to grant the major US corporations the right to veto other governments and continue efforts to open up other economies to US imperialist monopoly interests, while granting the major corporations tax holidays and handouts at home while facilitating their right to attack workers. This can be attested by the soaring value of stocks of some of the world’s biggest and deadliest corporations – arms, fossil fuels and pharmaceuticals – in the wake of the Trump election. All these can only be expected to further impoverish the toiling masses of the world, increase the concentration and over accumulation of capital in the hands of the monopoly bourgeoisie and exacerbate the crisis of overproduction that neoliberalism was intended to resolve in the first place. Meanwhile, the election of Trump and continuing control of the global economy by the oil, gas and coal barons and their elected fossil fuel supporters has the world facing an ecological catastrophe of the highest degree. As commentator Tom Engelhard writes: "With both the CIA’s coup-making and the military’s regime-change traditions in mind, could the United States also overthrow a planet? If, as the head of what’s already the world’s second largest greenhouse gas emitter, Trump carries out the future energy policies he promised during the election campaign – climate-science funding torn up, climate agreements denounced or ignored, alternative energy development downplayed, pipelines green-lighted, fracking and other forms of fossil-fuel extraction further encouraged and the US fully reimagined as the Saudi Arabia of North America-he will, in effect, be launching a regime-change action against Planet Earth." Of course Trump is not alone, just more transparent. Canada’s so-called "progressive" government of Justin Trudeau, who came to power on the promise of climate justice and a new relationship with indigenous people has just green-lighted two major pipeline developments, Kinder Morgan Trans Mountain Project and Enbridge Line 3 Replacement. These will massively increase the extraction of dirty oil from the Alberta Tar Sands, endangering the mainly indigenous as well as other communities along its route with pipeline leaks, explosions and ship weeks and rendering it impossible for Canada to respect its climate change promises made in Paris. 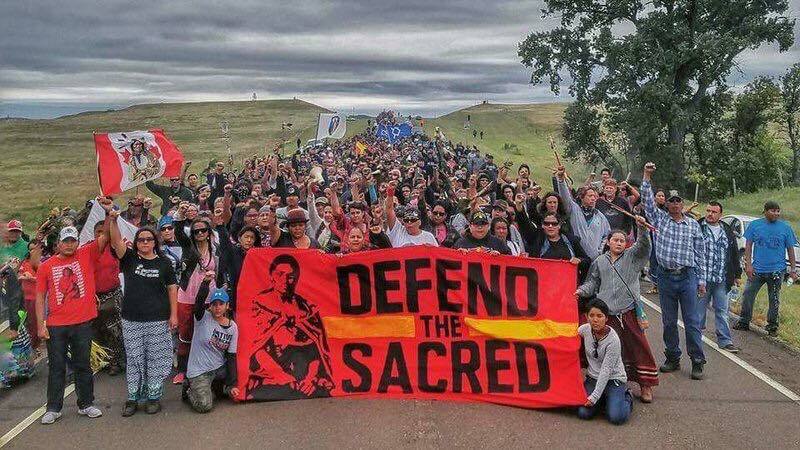 In the wake of events unfolding in North Dakota near the Standing Rock Sioux Tribe reservation, Canada’s Natural Resources Minister Jim Carr told business leaders that Canada is prepared to deploy the military against anti-pipeline actions deemed "not to be peaceful," raising the possibility the country could face a scenario last seen during the Oka Crisis in 1990. Business as usual also for Canadian imperialism. As people around the globe stand up for planet earth and environmental justice the imperialist offensive is already "not peaceful". At least 185 environment activists were killed in 2015, the highest annual death toll on record. Global Witness documented lethal attacks in 16 countries. Brazil was worst hit with 50 deaths, many of them killings of campaigners who were trying to combat illegal logging in the Amazon. The Philippines was second with 33. Colombia had 26 fatal attacks; Peru, 12; Nicaragua, 12 and Democratic Republic of Congo had 11. "As demand for products like minerals, timber and palm oil continues, governments, companies and criminal gangs are seizing land in defiance of the people who live on it," said Billy Kyte, a senior campaigner for Global Witness and author of the report. "Communities that take a stand are increasingly finding themselves in the firing line of companies’ private security, state forces and a thriving market for contract killers. For every killing we document, many others go unreported." The most deadly industry to protest against was mining, with 42 deaths in 2015 related to anti-mining activities. Agribusiness, hydroelectric dams and logging were also key drivers of violence and many of the murders occurred in remote villages deep within rainforests. But despite the repression, the people continue to resist and fight back, even in the heart of the beast. Hundreds of thousands took to the streets across the US immediately following the announcement of the Presidential win of Donald Trump. As the ILPS USA chapter stated: "This indicates the people in the United States are not paralyzed by fear not are we willing to tolerate fascism and state repression. We must organize to ensure this fight back movement is sustained and advanced." "The electoral results unmask the gravity of the social and economic crisis in the United States, the deep-seated slave-owner mentality still dominant with the ruling class and the gains of the divide and conquer tactics unleashed on by the people in the US to blur and diffuse the reality of class struggle and to protest the wealthiest in this country." The last period has also seen a resurgence of the African American people’s progressive and revolutionary organizations working for the self-determination of black people in the United States. This includes the ongoing mass movement Black Lives Matter and events marking the 50th anniversary of the founding of the Black Panther Party. They are likewise protesting the fact that US cops accost Africa-Americas and shoot down many of them, killing an African-American every 28 hours. There have been dozens of arrests, tear gas and dogs attacks and violent dispersals by police and militia. While the battle is far from over, with Trump promising to support the DAPL, the protestors won a halt to construction of the pipeline along its present route. The Standing Rock indigenous-led struggle is part of a number of such worldwide battles to confront and tame the fossil fuel giants and other extractives monopolies in the face of growing militarization of indigenous territories. Nine Gualinga, an Ecuadoran activist visiting Standing Rock, told the Bill Moyers report, "The world needs indigenous people. The statistics say that we are 4 percent of the world’s population, but we are protecting more than 80 percent of the world’s biodiversity."